Everett Green is a young sapling that is destined to be a Christmas Tree, but longs to be decorated every holiday, all year round, forever. Follow his adventure beginning as a small seedling to sapling, then where...the White House...maybe a family's home...then comes the end? Maybe not! Based on a family tradition, Everett Green will have your children loving him and all trees for that matter, all year long. This is an excellent book for nature lovers of all ages. 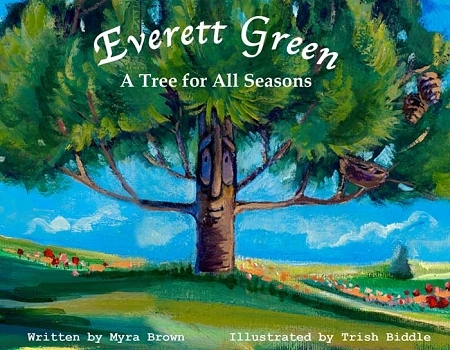 Written by the American Mother and Daughter team of Author Myra Brown and her Daughter, Illustrator/Painter Trish Biddle. Myra wrote the story over 25 years ago and this is her worldwide debut. Trish is a famous painter who paints Glamorous Women in Fabulous Places. These are signed by Trish, first edition hard cover photo book prototypes.